Home » Food Allergies » Products That Are Free of the Top 8 Allergens. A list of products and brands that are free of the top 8 allergens. Allergy friendly brands for baking, snacking, and more are included in this list. Being a parent to a child with food allergies means that you can’t just run to the store and grab any old brand of granola bars and cookies before a play date. You probably make a lot of your snack and treat foods at home, using ingredients that are free of the top 8 allergens. However, sometimes there are things that you have to buy from the store, whether it is baking ingredients, granola, seeds, or convenience snack foods. Since your food allergy diagnosis, you’ve probably become concerned with cross contamination and manufacturing practices. You know that food labeling laws in the United States aren’t the greatest. You’re cautious about the brands you choose, and you read labels carefully. Packaged products can be a cross contamination risk – that’s why it’s so great when companies make an effort to make their products and/or facilities free of the most common allergens. 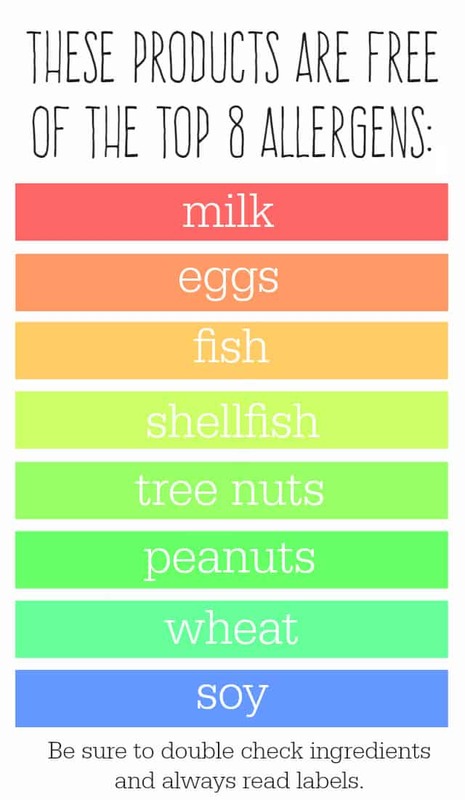 This is a list of products that are free of the top 8 allergens: milk, eggs, fish, shellfish, tree nuts, peanuts, wheat, and soy, and many of them are made in a facility that does not process any of these allergens. This is not a sponsored post. Disclaimer: I am not a healthcare professional. Please check with your doctor if you are unsure if these products are safe for you or your family. Always read labels, as ingredients and manufacturing processes change. This information is current as far as I understand it from the websites of these companies. Disclosure: This list does contain some affiliate links. 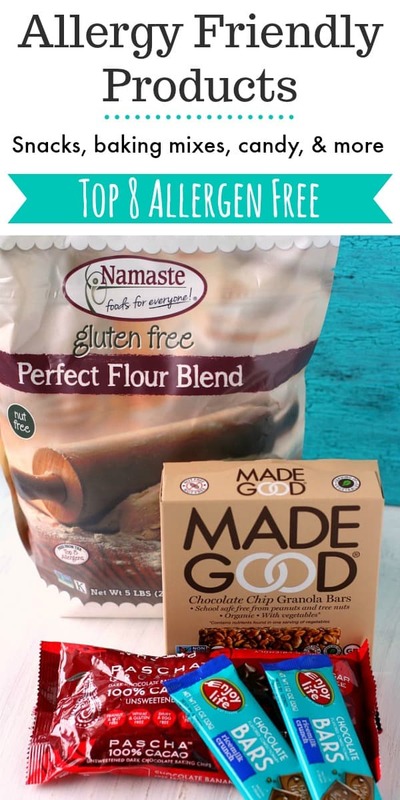 Namaste Foods – Baking Blend, Brownie Mixes, Pizza Crust Mix, Cake Mix, and more, made in a dedicated allergen free facility. 123 Gluten Free – Cookie Mix, Baking Mix, Biscuit Mix, Cake Mix, Bar Mix, and more, made in a dedicated allergen free facility. GF Harvest – This company makes all varieties of oats, as we as pancake mix, and single serving oatmeal cups. 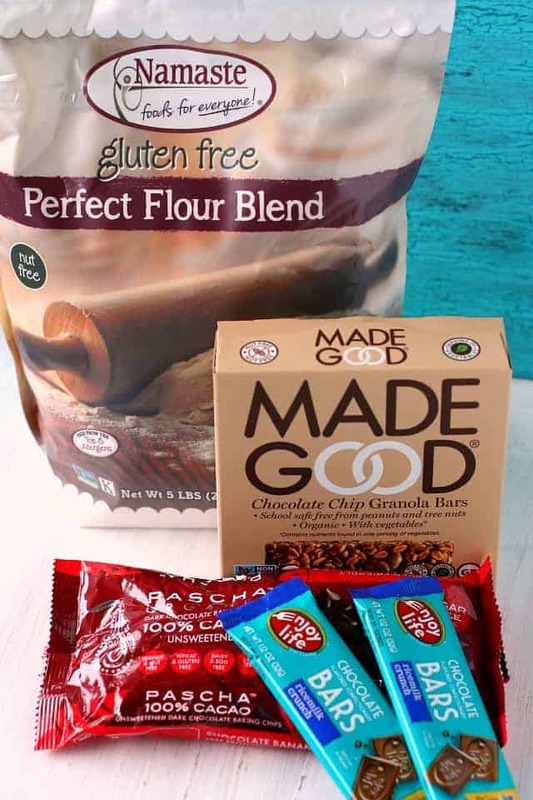 Living Now Gluten Free – Baking mixes, gluten free flour blend, and thickeners are all made in a dedicated facility. Better Batter – Gluten free flour, cake mixes, brownie mix, pancake mix, and corn free powdered sugar. Zema’s Madhouse Foods – Pancake Mixes, Pizza Crust Mixes, Cookie Mixes, and Brownie Mixes. Fun for All Foods – Top 8 free baking mixes that are fun for the whole family! Pascha Chocolate – Chocolate Bars and Chocolate Chips. PASCHA traces their ingredients back through the supply chain to ensure that they are allergen free. No Whey Chocolate – Chocolate bars and candy. Enjoy Life Foods – This company makes three varieties of chocolate bars, as well as three varieties of baking chips. 88 Acres Granola Bars and Granola – We love the sea salt dark chocolate variety! 88 Acres traces their ingredients back through the supply chain to make sure that they are allergen free. Enjoy Life Foods Chewy Bars – (My son likes the Cocoa Loco variety best). Enjoy Life makes a wide range of bars and snacks, including a new item – Breakfast Ovals. Enjoy Life Foods Crunchy Cookies (affiliate link). The chewy cookies are also a favorite around here. Gerbs Allergen Friendly Natural Foods – Dried Fruits, Granola, Seeds, Seed Butters, Cracker Mixes, Flours, Oats, and more. Made Good Granola Bars – Made in a dedicated allergen free facility. You can buy a case on Amazon here. (affiliate link) Made Good also makes granola bites, mini cookies, chewy marshmallow rice bars, and granola cereal. SunButter – This beloved allergy friendly spread is now free of soy, making it a delicious top 8 free alternative to peanut butter. Superseedz – Gourmet Pumpkin Seeds in flavors like cinnamon, tomato, curry, and more. Partake Foods – Delicious crunchy cookies in a variety of flavors. Safe + Fair – This company makes a variety of products, but their granola is top 8 free – our favorite is the chocolate! Products and ingredients change, so please contact these companies to see if their products are safe for your particular dietary needs. Do you know of any other top 8 allergen free companies or product lines? Share them in the comment section! This post was originally published in December 2014. It has been updated with more current information. « Super Vitamin C Smoothie. You can also check Naturally Free Inc. – http://www.naturallyfreeinc.com. They are a dedicated top 8 allergy friendly hair and skin care brand. Bob’s Red Mill has g f flours, mixes & a new 1to1 g-f flour to use in recipes! Also have. Steel cut oats, old fash rolled & quick cooking oats; coconut, millet,etc. Never had a problem w these products. He is a former Pastor who started this co. He has now given the co to the employees! thank you for this list!!! I was not aware of Namaste and 123 Gluten Free and I cried a little in relief lol, I’m to that point! And be very careful with YUM EARTH as they package some of their products in the same facility as ALL allergens. So the product may be gluten/soy free and even made in their dedicated factory, but then moved to the other factory for processing. It’s ludicrous. Their jelly beans are supposed to be safe and seem to be okay here (huge soy intolerance). Enjoy Life says all their products are free of the top 8 allergens. Thank you! I have updated the page! Thank you so much for this! I just turned 50 and about a week ago, was diagnosed with EoE, and advised to go on the 6 food elimination diet. I had no idea where to start, and am still struggling with what to eat and where to get it! This is a huge help! We like the “Really Great Food Company” mixes. That’s good to know, I will look them up! Vermont Allergy Free has chocolates and candies. Thank you so much for this information. I’m looking forward to trying Pascha, thanks to this list! I love your recipes (especially all your cupcakes) and am grateful for all the work you’re doing for those of us managing food allergies! Pascha is wonderful! So glad I can be a help! Bobo’s Bites is made in Boulder, CO. By the Simply Delicious, Inc folks. Package says may contain traces of nuts. Van’s may be a part of that company- haven’t checked. They make a breakfast bar we like but it does have almonds in it. Thank goodness my kiddo isn’t allergic to almonds! All other nuts, but we use almond butter and almond milk in most baked goods since he can’t do any of the other on the list and no coconut. . We love the Enjoy Life Choc mega chunks! This is awesome! Thanks for sharing all of your research. Thanks for sharing this post! It’s nice to know those products who cater to those with allergies! Yes, there are some great companies out there! Great list! Another newcomer on the market is Two Foodies Gluten Free Kitchen Pizza Dough Mix. It’s manufactured in a facility that is certified free from the top 8 allergens, for the reasons you mention above; families such as yours. Check it out…. http://www.twofoodiesglutenfree.com! It actually makes real pizza dough… no par bake or pressing out into a pan required. I loved this list Kelly! I know all these brands an products (allergy-free connoisseur! ), except for Gerbs! I am so happy you linked to them! I already see things I want to order, haha! I know, I was surprised at all the stuff Gerbs has! Lots of snacks! What a great – and complete list! Blessings to you as you continue prepping food for your precious family! Thank you, Kristen! Happy New Year!